When South African childhood friends and later entrepreneurs Thato Kgatlhanye and Rea Ngwane finished high school, they knew they wanted to start something that impacted young people and underprivileged communities. At age 18, they founded Rethaka, a social enterprise they hoped would do just that, although it would be two years before they figured out how. Repurpose Schoolbags is an environmentally-friendly innovation made from ‘upcycled’ plastic shopping bags with built-in solar technology that charges up during the day and transforms into a light at night. The initiative targets school children in underprivileged communities and looks at addressing a number of problems. 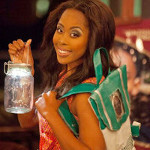 Firstly, the bags allow them to study after dark in homes without electricity. Secondly, the bags are designed with reflective material, so that children are visible to traffic during their walk to and from school. The production of Repurpose Schoolbags also involves the collection and recycling of plastic bags that typically litter the South African landscape. The first eight months of last year were spent piloting the schoolbags, followed by producing 1,000 bags from August to December. The company currently has eight full-time employees in their factory in Rustenburg, but Kgatlhanye says they will employ an additional 12 people this year in order to meet their production target of 10,000 bags for 2015. One of the ways the initiative gets its schoolbags to these children is through targeting corporate social investment budgets where companies can sponsor the production of bags. Each bag costs R250 (US$20), and covers the cost of employee wages and production, so the initiative can remain sustainable and continue to grow. Another model is to produce bags for delegate packs at corporate events where delegates can then choose to give the bag to underprivileged children after events. The company has already gained some major clients, including the likes of Standard Bank and PwC. According to Kgatlhanye, there is room to develop additional products along the same idea, such as raincoats. However, she added this is something the team will think about at a later stage, as they are still trying to ramp-up production of the schoolbags and expand to other communities. However, from a young age she did realise she wanted to have a positive impact on the society that surrounded her, a trait she owes to her upbringing and particularly her mother. “My mom cares about people like you wouldn’t imagine… so I grew up in an environment where I was always conscious of actually caring for other people and having a sense of empathy,” she says. Kgatlhanye describes her business journey as “instinctive” and has learnt some great tips that can help young entrepreneurs grow their business without capital. For starters, she believes there are alternatives for funding that don’t require involving investors, with the trade off of giving away equity in the business. For example, Kgatlhanye has benefited from a number of mentorship and entrepreneurship programmes. She was selected for an internship in New York with marketing guru and American best-selling author Seth Godin, and was picked as one of 18 South African social entrepreneurs to attend the 10-day Red Bull Amaphiko Academy last year. Furthermore, she was also selected as the 2014 first runner-up of the Anzisha Prize, where she won $15,000. “My advice is simple: bootstrap and find competitions to enter your business idea into,” she highlighted during an online Q&A session on the Anzisha Prize’s Facebook page earlier this year. However, most importantly, Kgatlhanye advises young entrepreneurs to trust their gut and admits that she has decided to lose mentors in the past simply because they shared different visions. As friends, Kgatlhanye and Ngwane have managed to work well as business partners. But for many, going into business with a friend has led to the death of a friendship. “One thing that’s key is when you form a business partnership with your friend, act as though you met that person that day,” noted Kgatlhanye. Another trick that proved beneficial for the co-founders was to get a business coach to help them get comfortable in their business relationship.